456 pages | 60 B/W Illus. Recurrent pregnancy loss presents a vexing clinical problem primarily for medical professionals treating patients in reproductive medicine and in maternal-fetal medicine. However, with its numerous causes and various suggested treatment options, the problem is more multidisciplinary in nature, involving gynecology, genetics, endocrinology, immunology, pediatrics, and internal medicine. 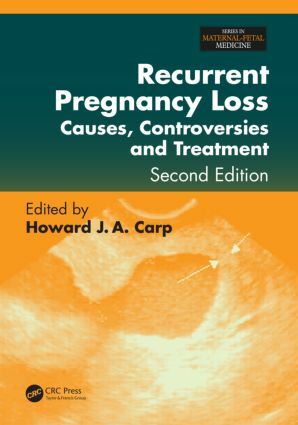 Exploring basic science and clinical applications, the second edition of the bestselling text Recurrent Pregnancy Loss: Causes, Controversies, and Treatment provides an authoritative and comprehensive update on advances in the understanding and management of this troubling phenomenon. The book covers basic scientific topics such as genetics and cytokines and profiles major advances in immunology, endocrinology, and thrombotic mechanism. It discusses the methodology of clinical research and the application of evidence-based medicine to clinical practice. It also reviews various late obstetric complications, along with issues caused by extreme prematurity and possible resulting handicaps. This second edition presents new material on the latest controversies, featuring opinions from both sides of ongoing debates. It includes new chapters on autoimmunity, third party reproduction, the use of immunostimulants such as CSF, and Chinese medicine. Designed for specialists working in reproductive medicine clinics and those involved with maternal-fetal care, the book is also ideal for generalists and gynaecologists seeking a comprehensive view of developments in the field. Prof. Carp studied Medicine at Charing Cross Hospital Medical School in London. He completed his training for the MRCOG in the UK. He has since worked at the Sheba Medical Center, Tel Hashomer, in Israel, and has held a Senior Lecturer post in Embryology at Tel Aviv University. He is Professor of Obstetrics and Gynaecology at Tel Aviv University. He has many clinical interests, including ectopic pregnancy, implantation, and infertility. He has edited two other books: The Infertility Manual and Principles and Practice of Assisted Reproductive Technology. Another book, Progestogens in Gynecological Practice is in press. He has published over 70 original research articles, 16 review articles and 6 chapters in books and has been invited to lecture in many parts of the world. Prof. Carp has taken a special interest in recurrent miscarriage, other forms of pregnancy loss, and infertility in general.